Hello all ls2017.com community members we got the last news about the upcoming Farming Simulator 17 right here. This time we will introduce all improvements of the dedicates server. Support for HTTPS/TLS/SSL when logging into the web interface, allowing for greater security. Mod Meta Cache, meaning the site loads faster than before when looking at installed and active mods. Support for ZIP files larger than 2GB. When a player does not have all the mods needed to access the save game of the server, they can download all necessary mods at once in one big ZIP file. Previously, this only worked if all mods together didn’t exceed more than 2GB. Now it works with larger ZIP files, too. Adding servers – Each server will have a unique 8-digit dedicated mobile app Pin Code. Give this Pin Code to friends you want to invite, and they can add the server to the app with it. Server Info – You can have a look at server info like hard drive usage, players connected, RAM usage, installed mods and more. You can also have a look at the map of the active savegame and see where all the vehicles and tools are in the world and how much money your farmers have. 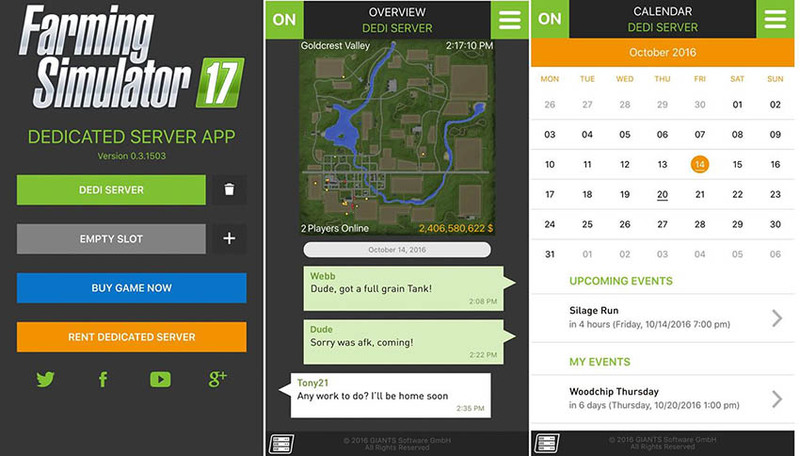 Chat & Friends – Each server has its own chatroom within the app. You can chat with everyone who used the Pin Code and added the server. With push notifications you will also never miss anything of the conversation. It can be used as a way to stay in touch with each other via your mobile device, without sharing private data like phone numbers or social media accounts. With the integrated friends list it is possible to keep track of who is currently online. Note that this chat functionality only allows chat for app users (not between app users and those in-game). Community management – Server admins can delete people from chat/the app if needed. Moreover, now you will be able to create various events with a shared calendar and invite all your friends. To use the calendar is up to you, if you want to share some information about gaming sessions or who will farm fields at what time and so on. Push notifications will alert all the players that nobody would forget about the upcoming event. 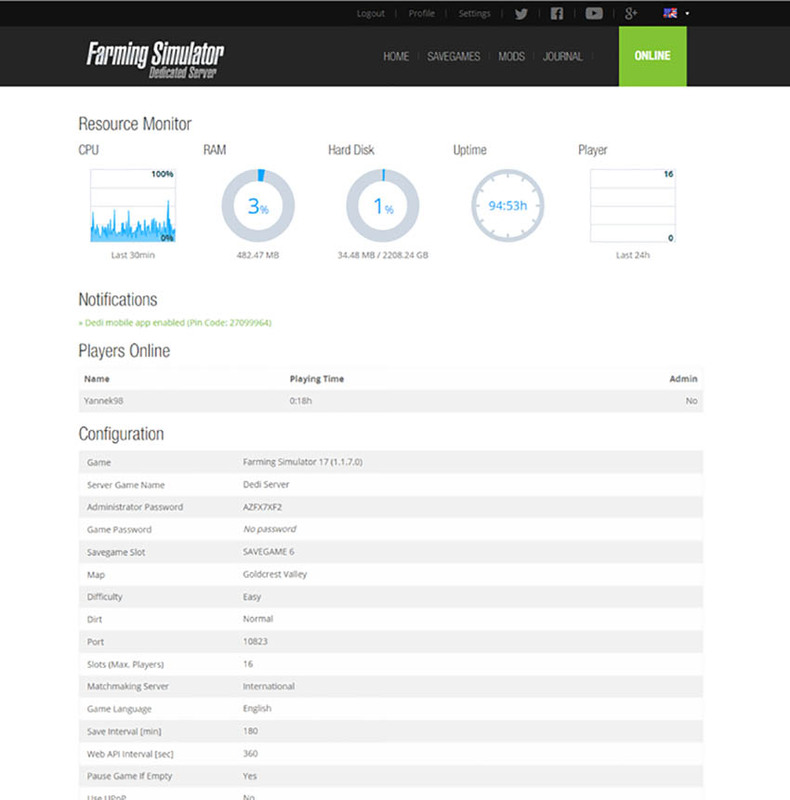 Lastly, you can deploy a dedicated FS17 server on your own Windows Server hardware. (Please consult the PDF document dedicatedServer_EN.pdf enclosed in the game for further information about the detailed hardware and software requirements). So this is it, with only just moments away of the game launch stay tuned to ls2017.com because we will bring your daily doze of the newest FS17 mods for free. Get ready for next week! Farming Simulator 17 will be available on October 25th for PS4, Xbox One, and PC.